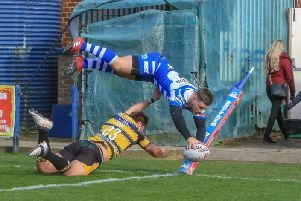 Half back Gareth Moore has admitted Halifax need to find a way to speed their game up if they are to triumph in Sunday’s Championship Shield semi final against Sheffield at the Shay (3.0). Fax have struggled to get their attack into gear in recent weeks, something Moore is well aware has to change when they go up against Mark Aston’s Eagles. “We all know our individual performances haven’t been what they were in mid-season,” admitted Moore, who is likely to be back alongside regular partner Scott Murrell after the captain was rested for last weekend’s win over Workington. “It’s about confidence too; we’ve been picking up results but we’re still not high in confidence. “Missing out on the top four was a big hit on everyone and a lot of teams have been playing quicker than we have. “Workington basically rolled us with 14 men at the weekend; they had one interchange player, we had four. “That’s not good enough really. “Our plan was to try and play quickly basically around the middle and we didn’t do that. “It’s going to be the same this week. If we aren’t better than them in the middle, it’s going to be hard for us. “We have to fix some stuff up this week. “We’ve not been happy with the way we’ve played over the last six or seven weeks, but it’s semi final time now and we know if we don’t get it right next week we won’t be going to a final. Fax officials have opted not to open the South Stand for Sunday’s game, with all supporters being seated in the East Stand. Admission prices have also been reduced, with adult seating £15, concessions £10 and juniors £1.